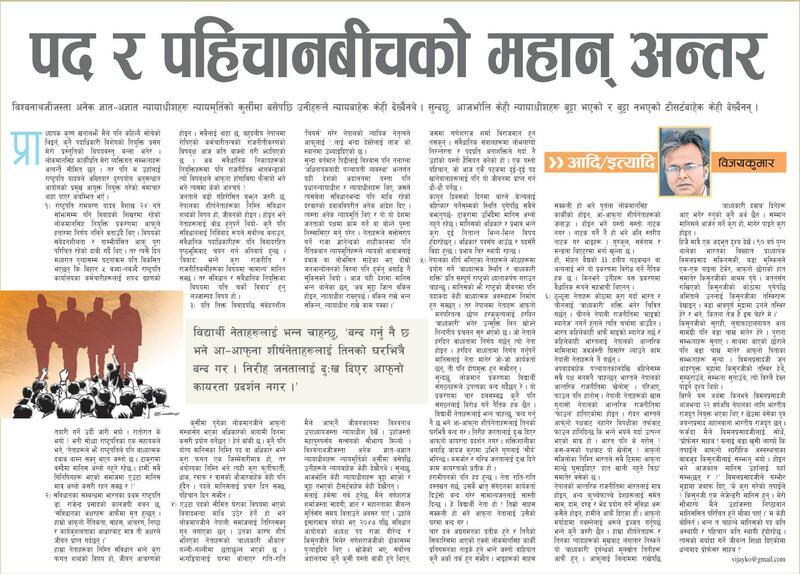 The Vijay Kumar Article: पद र पहिचानबीचको महान् अन्तर | United We Blog! We believe this write against the journalist is absolutely unnecessary. The Supreme Court shouldn’t have accepted the writ in the first place. This we think is a ploy to intimidate the media world, especially those who are critical of the recent acts of the Supreme Court and some of its justices after the Chief Justice was made to head the government blatantly crushing the concept of separation of power. First of all, we all know that this is not about the dress code. We all know that Kantipur has been running critical coverage of controversial appointment of Lokman Singh Karki as the chief of the anti-graft body CIAA. We also know that Chief Justice, in his capacity as the Chairman of the Council of Ministers and head of the Constitutional Council that recommends names for the top vacant positions at constitutional bodies like the CIAA, was hell bent on appointing Karki as the CIAA chief. We know this as well that Chief Justice/Chairman of Council of Ministers, Khil Raj Regmi, was under foreign pressure to make that appointment. Just so it happened that, in this case, Regmi was not the only one to have been pressurized by the foreign force to make this appointment- UML chairman Jhalanath Khanal, who as one of the members of the four-party High Level Political Committee to recommend Karki’s name to the Constitutional Council, has publicly accepted that India was behind this appointment that included the President of Nepal changing his stand overnight with regard to the doubtful and controversial characteristic of Lokman Singh Karki. In this bitter background it is now no secret that the Supreme Court has lost the respect that people had for it. Critical comments disapproving the SC and other justices’ (including the CJ himself) acts and decisions in social media, tea-shops and other gatherings of general public are testament to this. The Supreme Court that has lost its independence and moral authority to deliver fair verdict shouldn’t plunge further by intimidating free media and sovereign will of people. We at UWB express our solidarity with Vijay Kumar and Kantipur. To do this, we reproduce the Vijay Kumar article below. Visit Vijay Kuamr’s FB page. हाम्रा नेताहरूका निम्ति संविधान भन्ने कुरा फगत शब्दको विषय हो, जीवन आचरणको होइन । सबैलाई थाहा छ, बहुदलीय नेपालमा रोपिएको कर्मचारीतन्त्रको राजनीतीकरणको विषवृक्ष आज कति बाक्लो गरी झांगिएको छ । अब संवैधानिक निकायहरूको नियुक्तिहरूमा पनि राजनीतिक भागबन्डाको त्यो विषवृक्षले आफ्ना हाँगाबिंगा फैलायो भने भने त्यसमा केको आश्चर्य ? Previous PostElection Government or Elected One?Next PostAuditor General’s Report: a Mere Formality or an Effort to Maintain Accountability?